Our Vinyasa yoga classes are perfect for anyone seeking a regular yoga practice. These are not prenatal classes. We offer 8 regular yoga classes a week and each one is a little bit different. See each individual class description below. Find your breath, get comfortable with yoga, or elevate your practice. All levels of yoga are welcome. A night of Zen! Just you and your mat surrounded by calming music in a room full of candles. 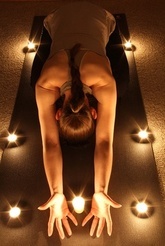 Relax from a hectic day and enjoy the tranquility of our candlelight flow and restore yoga class. The class will begin slowly with lots of stretching and emphasis on breath. You will work your way up to a flow building your strength, and then wind down ending on a peaceful note. This yoga class is designed to take your mind off your busy life so you can concentrate on you! The babies and children are tucked away at home. This is a time for you to unwind from your day, and bring balance to your busy life. All levels of yoga are welcome. Enjoy a vinyasa flow yoga class that builds warmth and connects you to breath. Vinyasa yoga encourages us to move with breath and intention. Flowing movements build strength and conditioning in our bodies, while a focus on proper alignment heals our bodies and releases tension. The experience in this class is one of fluidity and motion. Transitions with breath allow poses to flow from one to another developing strength, stamina and flexibility while also calming the mind. This is a dynamic class where yoga experience is encouraged. Please note this is not a prenatal class. A fast-moving, fun and challenging Energizing Vinyasa Flow class. Please note this is not a prenatal yoga class. Expecting mamas please register for one of our prenatal yoga classes. Combining a heat-building flow with creative sequencing, arm balancing and some inversion practice. You will move and feel from the centre of your body learning to engage the core more deeply and intentionally in all postures. Strength balanced with stretching and time spent holding poses will build focus, self awareness and confidence. This is a beautiful and energizing class helping the mind, body and spirit to glow. Perfect for people with a more regular yoga practice looking for a challenge. Please note this is not a prenatal class.